Bonding clamp that fits 1/2" and 5/8" Thimbleye® expanding, rock, and crossplate anchor rods. Thimbleye® bonding clamp that fits 1/2" and 5/8" Power Installed Screw Anchor rods. 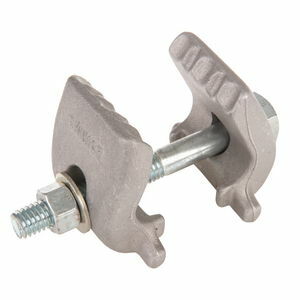 Thimbleye® bonding clamp that fits 3/4" and 1" Power Installed Screw Anchor rods. Tripleye® bonding clamp that fits 5/8", 3/4" and 1" Power Installed Screw Anchor rods. Bonding clamp that fits Tripleye® 3/4" and 1" expanding, rock, crossplate and no-wrench anchor rods. Twineye® bonding clamp that fits 5/8", 3/4" and 1" Power Installed Screw Anchor rods and 1" Expanding, Rock, Pole Key and Crossplate Anchor rods. Bonding clamp that fits 5/8" and 3/4" Twineye® anchor rods used with expanding, rock and crossplate anchors.